15mm.co.uk: Base in the Place! 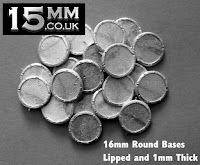 Classic 16mm Round Thin and Lipped bases return! Base in the Place! Classic 16mm Round Thin and Lipped bases return! 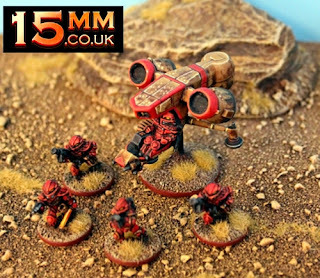 All of us at 15mm.co.uk are delighted to announce the return of one of the favourite bases from our ranges. New molds and a new code LBA8. Also now with the option of buy more and save more on the page. Go HERE or read on for more information. Our fantastic original 16mm round lipped thin white metal base is ideal for 15mm wargame miniatures. It is 1mm thick and rimmed for inclusion of basing effect if you choose to apply it. Now back in production and a firm favourite with Laserburn players. Very durable and tight fitting to your miniatures it gives them a solid standing on the gaming table. As you can see from the image they have a lovely look and feel great too. Produced from top quality molds. We offer a pack of 20 Bases and several other sizes of packs each with a saving over the twenty pack. Click on the drop down product menu on this page to see all the options. You can select 20 Bases, 50 Bases saving 5%, 100 Bases saving 10% or the mighty 500 Bases saving a whopping 20% off list price. Suitable for use with any 15mm Infantry or Creatures or even with other scales such as 6mm or as objective markers and parts of dioramas. Go HERE.